Deepa Tampi worries a lot about the air her two children breathe. The garment exporter says she believes her 14-year-old daughter Mahika and 12-year-old son Vihaan both became asthmatic because of high levels of pollution in the New Delhi area. She has banned them from playing outdoors, and has even moved their schools twice in four years so that they can use indoor sports facilities. When there is a toxic haze covering the Indian capital – as has been the case in recent days – she makes sure air purifiers are running at home and in the car, and when the kids do go outside they wear masks. “Every year, we gasp through the winter months, armed with oral steroids, inhalers and nebulisers,” she said. The family paediatrician has suggested they leave the Delhi area because of the kids’ asthma, Tampi said, and in the past they have even considered emigrating. But a big change like that is not easy when she is running a business and her husband is a partner at a law firm. Tampi, who lives in Noida on the outskirts of the city, is in a small minority. She has the knowledge and, more importantly, the money, to reduce the impact of the toxic cocktail of pollution on her kids. That is not the case for most of New Delhi’s population of more than 20 million, many of whom are worried about where the next day’s work or the next meal is coming from. Rajesh Kumar, 37, who works as a contract employee with a catering firm, said his two children develop a cough from around mid-October, when the pollution levels rise, until the air quality improves in January. 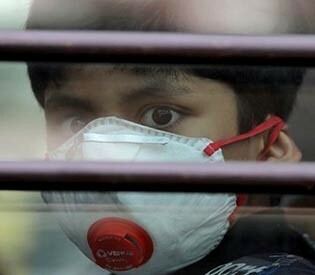 Doctors say that many thousands of children are becoming victims of respiratory illnesses in Delhi and its suburbs. More than 10 percent of India’s schoolchildren suffer from asthma, according to the federal government. Pollution levels in the city rose to “severe” last Thursday, a day after revelers let off fireworks long into the night to mark the Hindu festival of Diwali. Two federal government pollution indexes showed air at “very poor” and “severe” levels, indicating that prolonged exposure could lead to respiratory illnesses. North Indian cities, including Delhi, top a list of places with the worst air in the world, the World Health Organization said earlier this year. “Cough is the first symptom of irritation of your breathing tract. When it becomes more severe, then you start developing narrowing, which manifests as breathlessness and then you need a nebuliser,” Kumar said. The federal government launched an asthma manual for schools in 11 languages last month after several incidents, including deaths, blamed on a lack of awareness of the illness. The 3,000-pupil school, established in 1989, jostles for air amidst smoke-spewing small-to-medium-sized factories, new high-rise residential buildings, a busy flyover and a rail track.